Hi my dear blog Friends! 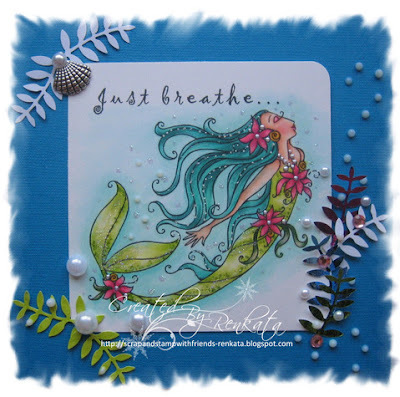 Today I will show you a card with the amazing image from Michelle Perkett Studio . Her images are enchanted and whimsical. Use colors associate with the ocean, its marine-life, shells and mermaids! have Fun colouring and come join us at CMC Copic Challenge Group. The challenge will run untill 25 Nov.
Hope eryone is well. Today my card is for my DT post at The Digi Bells . I did use the adorable digi image Li'l Lynda Piano Forte by Elisabeth Bell, she is coloured with Copics- V99, 95, 93 and then over the whole dress with Y000 to give the dress a bit of velvety look, lol. Isn't she adorable singing Christmas carols, lol. The challenge at Elisabeth Bell's World challenge blog- Pink,Purple, Pearls and Pretties is still on. For the challenge at CMC Copic challenge group - All about Boys, you still have time untill 11 Nov.